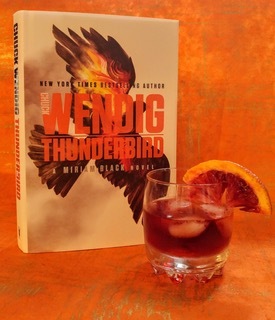 Chuck Wendig, author, screenwriter and game designer, has stepped behind the bar this week to create a special drink just for his new book, Thunderbird. You can also find Chuck at his blog, Terrible Minds. Miriam is becoming addicted to seeing her death visions, but she is also trying out something new: Hope. Miriam Black is about as bitter as they come – she’s a dark, smoky, salty drink of venom, but she’s a dark soul with a faint glimmer of light in her dead heart. She’s back in Thunderbird, pursuing a lead that hopefully helps her end her psychic curse – the one that lets her see how other people are going to die just by touching them – and that takes her on a journey through the American Southwest. As such, I think a drink that emblemizes her and the book is a Negroni that replaces the traditional gin with Mezcal – Mezcal of course being the smoky, heady variant of tequila. But I also think you want a little tartness in there, too. And given the content of the book, I think blood orange is a nice addition. Because blood. Shake, shake, shake. Garnish with an orange slice, or maybe an ashtray or like, let a blackbird sit on the rim of the glass. Drink. Then curse. Then spit. Then become birds and use your beaks to dissect your enemies. If you want to check out some free short stories written by Chuck, all you have to do it click here, and then read them.